Natalie Anja Esser is a Premium member and benefits from additional features. The Rose Touch is my own form of Quantum Healing, that is once a month given as a free group Session. While the first 30 minutes of the Webinar you can join to experience the Transmission of "The Monthly Rose Touch" live. 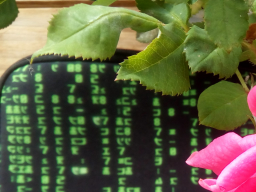 We will then continue with the Rose Talk, my Co-Host will be again Therese Wenk, as she is working with energetic codes and this month topic is:"The Code of Life...and going beyond". All around us can be described in mathematics and codes. Or not? We´ll take a look at Holy Geometry, the building blocks of life, duality, the matrix and what happens when we go beyond. "Trinity is the unity behind duality"